Infused vodka was a turning point for me. I have come a long distance on my journey to the perfect bloody Mary recipe. As a student of the Hemingway school, I mixed them by the pitcher and believed, “anything less is worthless.” As I learned that one size does not always fit all, I began hand crafting my bloodies, one at a time, to the tastes of my guests. These guests have guided my hand as I explored various ratios of ingredients and new flavors. Then I got thinking…That dehydrator kicks out heat all night long. Why spend all of that energy dehydrating my lovely vegetables, only to re-animate them later? Inspired by the cold press coffee movement, and my eco-frenzied sweetheart, I had an epiphany. I would eliminate the energy and flavor sucking middle man, and infuse these vegetables directly into my infused vodka! Infused vodka is not limited to the obvious. I’ve infused lemons, limes, peppercorns, horseradish root, radishes, habanero, jalapeno, bell, and banana peppers, onions, garlic, celery, even bacon. (Mmm) Next on my list are fresh dill weed and cucumbers. Nothing beats the full fresh flavor that infused vodka creates. I still enjoy going back to a Hemingway from time to time, but most of my bloody’s these days spring from that lovely decanter. Leafy vegetables and porous items infuse quickly. a few days is all that is needed. Peppers are a great choice for your infused vodka but be careful. If you leave them in the booze more than a week or two, the vodka will become bitter. Infusing with bacon is a delicious way to improve your bloody Mary but be sure the bacon is fully cooked before infusing! Feel free to share your own infused vodka ideas by clicking on the COMMENTS link below. Cheers! So you have your infused vodka-now what? 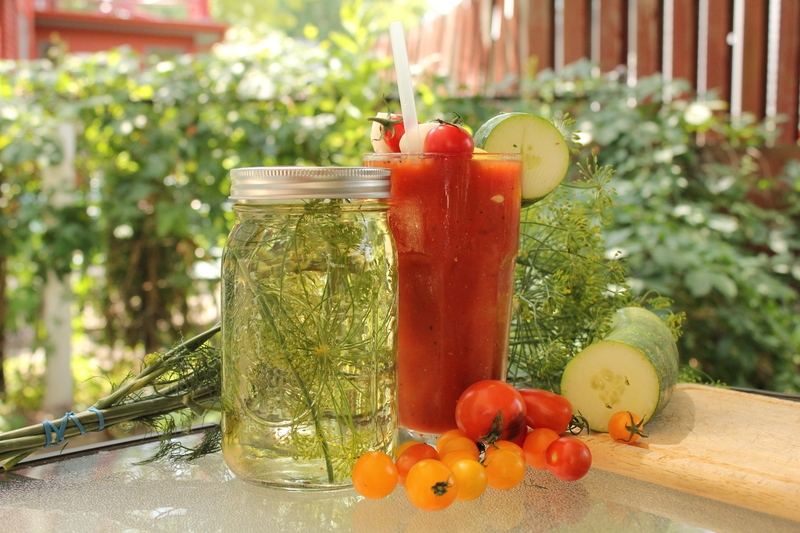 Check out some of our bloody Mary recipes!